The club is named after the ancient land ‘hundred’ covering the Rendlesham forest area of Suffolk. The first maps showing Plomesgate were produced in the 17th century by cartographer John Speed in 1610. The club was formed, not as competition to the other clubs in the region, but to fill a void of no other club focusing on this part of the county. It started with discussions to form the club on November 16th, 1990 and has an official start date of 1st February 1991. That same year the club held its first series of evening club time trials. Also in the inaugural year, members participated in a Lands End to Leiston sponsored ride. In 1992 the club held its first open time trial. In 1993, the club had a trip to France to see the Tour De France, the first 12hr event was completed by a club rider, and a Boxing Day hill climb event was held. 1994 saw the husband and wife team of John and Dawn Chalker win the clubs first open TT on their tandem. (Pete Whelan & 12yr old daughter, Sarra, then of Wolsey CC were 2nd). In the summer of 1994 the club made a trip to the south coast of England to see the Tour De France UK, coming back with a few of the roads signs as well. In 1996 there was a bit of a change to the club, with it becoming a democratic organisation and seeing some of the founders and controlling members resign. The club helps the RSPB in arranging the 3 Reserves sponsored bike ride around the bird reserves in the area. 1997 sees the current design of club clothing come about, with its distinctive pine tree (Rendlesham Forest) and bright yellow background. 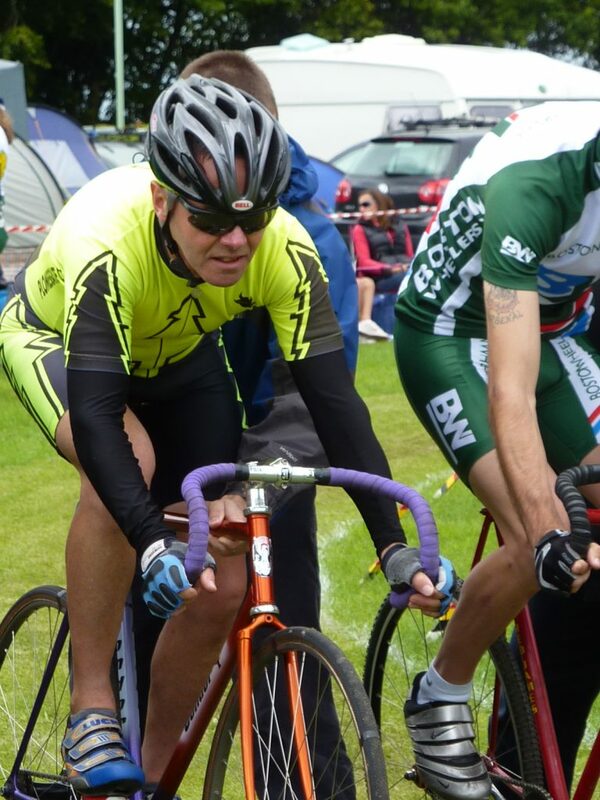 The club was also instrumental in reviving the SPOCO East time trial series using the more SPOrting Courses instead of the dual carriageways often seen for time trials. 1997 also sees the club have a member serve on the RTC (now CTT) East District Committee. The club was also invited to participate in the Godric CC Roller racing league that winter. 1998 sees the dawning of the internet age for the club with the launch of the Plomesgate CC website, a first for racing clubs in East Anglia. The club also promoted an event for the, now defunct, Essex & Suffolk Border Combine series of events, and also having the winning team in the hill climb event that year. The club was instrumental in running/organising the British National Time Trial on behalf of the eastern region, in fact it was only the 2nd time the event had been run nationally. In 2003 the club promoted its first open grass track event at Woodbridge, St Mary’s school field, and continues now on a better field at Bredfield bringing riders from all parts of the UK. The club has continued to promote its club and open events and is slowly growing in number year on year.